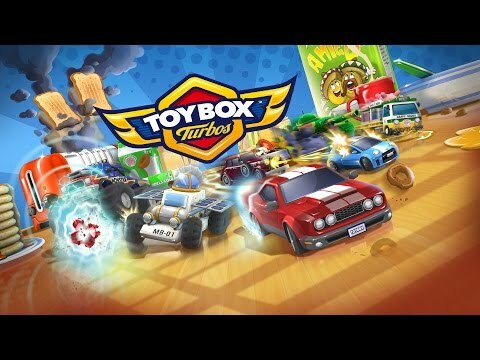 Download game Toybox Turbos right now! Collect and customize 35 vehicles in this pick-up-and-play arcade racer. Take on 18 obstacle and short-cut filled circuits built for chaotic, combative competition – speed past spilt sticky jam on the kitchen table, dodge flaming Bunsen burners as you take your opponents back to school and dodge the runaway train as you race around a railway set! Master six game modes in the single-player game, then turn friends into foes in manic four player multiplayer - local, online or with a mix - perfect for those one-more-go gaming session that race into the night! Toybox Turbos – the top-down racing game bursting with miniaturized mayhem, featuring dinosaurs, combine harvesters, golf-buggies and so MUCH more!